Order Your 844 Number Now! 844 is the latest of all toll free prefixes introduced. The other toll free prefixes that were introduced prior to 844 are “888”, “877”, “866” and “855”. These toll free prefixes work the same way as 800 and offer its users identical benefits and advantages. Customers and prospects from across the US and Canada can call a business for free using numbers with any of these toll free prefixes. In addition to being a powerful communications device, they also function as an effective tool for marketing, sales, advertising and business promotions. Businesses can enjoy advanced features including auto attendant, voicemail, multiple voicemail boxes, call forwarding, and voicemail transcription. A number with the “844” prefix will make their communication stronger and more effective. 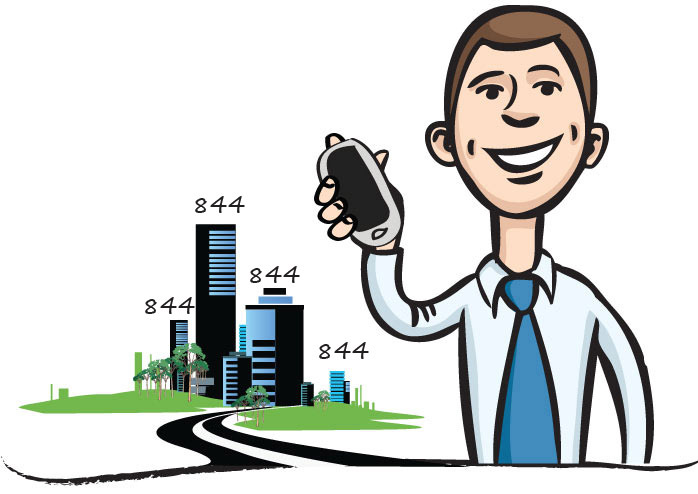 Use an “844” toll free number and give your business the edge it deserves! Sign Up for an 844 Number Now!